Dylan Grant and brother Trent. YOUNG blower Dylan Grant took a bag of five wickets including a hat-trick in the first game of the season to help lead Bushy Park to a great win, thumping the MacKillop Beltas by 168 runs. 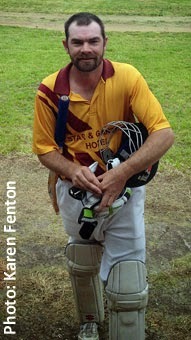 Grant took all five wickets without any assistance, with three victims bowled and the other two caught and bowled. Meanwhile his brother Trent Grant picked up four wickets in a fine performance of his own, while the eldest of the brothers, Nathan Grant made 42 with the bat. All-rounder Mitch Crosswell showed early form with a well-made 69. It was a great result for Bushy Park which is now in Third Grade after a tough season in Second Grade in 2013/14. Molesworth bastman Brad Coppleman racked up an early century to guide his team to a 85-run win over Claremont at Abbotsfield Park. Coppleman hit 13 fours and a six on his way to exactly 100 runs. Captain Jamie Adams gave great support with a fine 58 allowing his team to reach the great score of 6 for 224 off the allotted 50 overs. In reply Claremont was never in the hunt and was bowled out for 139 due to some very good bowling by the Molesworth quicks, in particular Nathan Eiszele who sent down 9.5 overs 4 for 26 and Josh Bomford 3 for 17 from seven overs, the pair giving very little to the Claremont batsmen. New recruit Jake King picked up one wicket as did Jamie Adams and Brad Coppleman who capped off a great day's cricket with his ton earlier. Moving up to Fourth Grade, New Norfolk II had a close win over Lindisfarne. Making 146, New Norfolk had a total to defend. T. Smith and returning player N. Heron top-scored with 24 each. In reply the home team fell just five runs short, giving the Red Caps a great first-up win. Heron capped off a great day picking up four wickets to be the best of the New Norfolk bowlers while Adam Nossiter got three. Lindisfarne didn't help their cause by bowling 40 extras. In First Grade, New Norfolk I went down to a good Claremont outfit at Tynwald Park. The visitors had first hit, making the good score of 7 for 229. For the Red Caps, Josh Rowlands put in a good effort taking three wickets while new recruit Aaron Drew took two in his first match for the club. Josh Walsh also bagged two. In reply, New Norfolk didn't really get going and was bowled out for 118 with Leigh Berry top scoring with 26 and Josh Rowlands again contributing with 23. The Red Caps may have lost their first match in the higher grade, but I'm sure there will be wins ahead as the season progresses. In other matches, Molesworth II went down to Dynnyrne. Talented youngsters Jacksyn Mann and Jye County did well for their team. Mann made a terrific 66 not out and took two wickets while Jye County made a good 35 and bagged 3-33. Captain Brayden Hodge also picked up three wickets. In the other Third Grade match, Gretna II went down to Campania by seven wickets. Having first hit, Gretna made the small total of 92. Bruce Emery made 19 and Brodie Gleeson 11. With the ball Adam Browning and Luke Crosswell tool one each in Campania's total of 3 for 97. 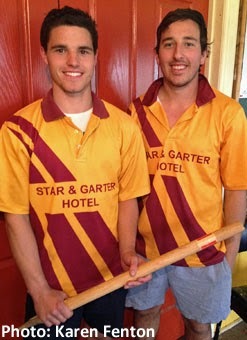 Congratulations to Gretna's two debutants, twins Zac and Luke Crosswell. Zac is the 290th player and Luke the 291st to play for the club since the 1977/78 season. In the other Second Grade match, Gretna I went down to Montagu Bay at home by six wickets. Having first hit, Gretna was bowled out for 124. Vice-captain Corey Ransley top scored with 18 and Rhys Browning and Todd Jarvis were next highest with 15 runs each. In reply Montagu Bay reached the total off 36.2 overs to claim the Ashes trophy the two clubs have played for over the past few seasons. For the Gretna bowlers, all tried hard with Jackson Ackerly, Brock Nichols and Craig Cunningham taking one wicket apiece. FIRST GRADE - Saturday, October 18. Claremont 7 for 229 off 50 overs d New Norfolk I 10 for 118 off 33.2 overs (14 extras) at Tynwald Park. New Norfolk I - batting: Leigh Berry 26, Josh Rowlands 23, Chris Ashcroft 18, Richard Graham 15. New Norfolk I - bowling: Josh Rowlands 3-44 (10), Aaron Drew 2-45 (9), Josh Walsh 2-62 (10). SECOND GRADE - Saturday, October 18. Montagu Bay 4 for 127 off 36.2 overs (14 extras) d Gretna I 10 for 124 off 39.1 overs (18 extras) at Gretna. Gretna I - batting: Corey Ransley 18, Rhys Browning 15, Todd Jarvis 15, Jackson Ackerly 14, Tom Allcock 11, Daniel Browning 10, Craig Cunningham 9. Gretna I - bowling: Jackson Ackerly 1-16 (3.2), Brock Nichols 1-20 (3), Craig Cunningham 1-26 (5). Molesworth I 6 for 224 off 50 overs (26 extras) d Claremont 10 for 139 off 39.5 overs (23 extras) at Abbotsfield Park. Molesworth I - batting: Brad Coppleman 100, Jamie Adams 58, Daniel Adams 15, Nick Piuselli 10. Molesworth I - bowling: Nathan Eiszele 4-26 (9.5), Josh Bomford 3-17 (7), Jamie Adams 1-18 (3), Brad Coppleman 1-24 (7), Jake King 1-25 (9). THIRD GRADE - Sunday, October 19. Bushy Park 10 for 247 off 45.5 overs (36 extras) d MacKillop Beltas 10 for 79 off 25 overs (22 extras) at Bushy Park Showgrounds. Bushy Park - batting: Mitchell Crosswell 69, Nathan Grant 42, Danny Mason 40, Troy Smith 24, Jason Crosswell 11 not out, Peter Madden 10. Bushy Park - bowling: Dylan Grant 5-25 (7) including a hat-trick, Trent Grant 4-15 (6), Troy Smith 1-20 (6). Campania 3 for 97 off 20.1 overs (6 extras) d Gretna II 10 for 92 off 28.2 overs (28 extras) at Campania. Gretna II - batting: Bruce Emery 19, Brodie Gleeson 11, Luke Crosswell 5 not out. Gretna II - bowling: Adam Browning 1-21 (5), Luke Crosswell 1-30 (5). FOURTH GRADE - Sunday, October 19. New Norfolk II 10 for 146 off 45.5 overs (40 extras) d Lindisfarne 10 for 141 off 48.5 off 48.5 overs (24 extras) at Lindisfarne. New Norfolk II - batting: T. Smith 24, Nathon Heron 24, Kyle Harrington 13. New Norfolk II - bowling: Nathon Heron 4-23 (10), Adam Nossiter 3-32 (9.5), Mitchell Rice 2-41 (9). Ashley Morgan 1-20 (10). FIFTH GRADE - Sunday, October 19. Dynnyrne 10 for 192 off 49.2 overs (20 extras) d Molesworth II 9 for 173 off 47 overs (24 extras) at Boyer Oval. Molesworth II - batting: Jacksyn Mann 66 not out, Jye County 35, Brett Hodge 20. Brayden Chaplin 11. Molesworth II - bowling: Brayden Hodge 3-21 (10), Jye County 3-33 (10), Jacksyn Mann 2-40 (9), J. Mallinson 1-9 (1.2), Josh Ransley 1-27 (10).